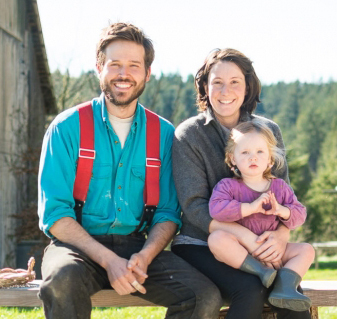 Sage Dilts owns and operates Barn Owl Bakery alongside her husband, Nathan Hodges. After earning a B.A. in Community Planning and Development, Sage spent time in politics and the non-profit sector working on food and nutrition issues. Then, looking for a more direct way to manifest her ideals about functional food systems, she began her baking in the Headland Center for the Arts in the Marin Headlands, working with Eduardo Morel of Morel’s Bread. The focus on small scale wood fired naturally leavened whole grain bread was the inspiration for her own baking when she moved to Lopez Island in the summer of 2011. After baking out of a small apartment in a 100 year old barn she moved to a wood fired oven at Captain Kenny’s house. Then, in the summer of 2012, Nathan built the bakery and wood fired oven and Barn Owl Bakery was born. Nathan Hodges is the baker and all-around business helper for Barn Owl Bakery. After earning a B.S. in Environmental Science and a M.L.A. in Landscape Architecture, Nathan got charmed into managing the oven, chopping all the fire wood and baking the bread when Sage was pregnant with Eden and hasn’t looked back ever since. Nathan heads the grain trials and works with farmers on Lopez to grow more and more of the bakery’s grain. He is also a land artist and environmental consultant, look for his work at nathanrhodges.tumblr.com and nathanhodges.net.